There are numerous types of space maintainers. They range from the very simple to those with numerous bands and wires. They can be constructed differently and used in different parts of the mouth. We feel the best way to make sense of the numerous types and subtypes of space maintainers is to start by classifying them broadly into four categories. They can be fixed or removable, and they can be unilateral or bilateral. A removable space maintainer, of course, can be removed. A fixed space maintainer is fixed (i.e., held) to a tooth or to more than one tooth. Fixation usually is done by cementing the space maintenance appliance in place. Unilateral space maintainers are fixed to one side of the mouth and bilateral space maintainers are fixed to both sides of the mouth. 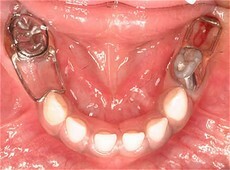 Fixed space maintainers can be unilateral or bilateral. Space maintainers also can be placed on the mandibular or maxillary arch. Consequently, we could have a maxillary removable bilateral space maintainer, or a mandibular fixed unilateral right side space maintainer, and so forth. There are numerous variations on these basic themes. For example, some space maintainers are used for missing anterior teeth and some are used to preserve space for posterior unerupted teeth. Pembroke Pines Dentist | Space Maintainers. Marc Siegel is a Pembroke Pines Dentist.